The Insight Center grew out of LA Dharma, a non-sectarian Buddhist meditation organization. 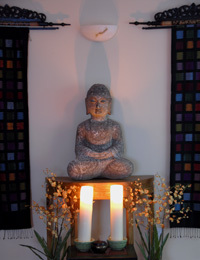 Through LA Dharma we hosted meditation retreats, sitting groups and mindfulness classes from 2000 to 2006. In 2006, we acquired our physical space and formed the Insight Center to continue the legacy of LA Dharma while offering somatic practices to more deeply support our students. 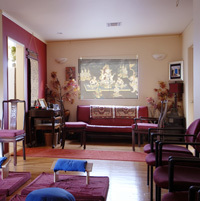 With our permanent home, we began to offer clinical trainings and psychotherapy services, and in October 2007, we launched our Continuing Education Program for mental health professionals with authorization from the American Psychological Association, the California Board of Behavioral Sciences and the California Board of Registered Nursing. While we continue to offer classical Buddhist teachings and courses in mindfulness meditation, our clinical specialty focuses on healing early developmental trauma. We collaborate with some of the nation’s foremost clinicians and teachers, and have recently expanded our faculty to train therapists in the use of touch and clinical intuition in psychotherapy. We host innovative programs in the areas of mindfulness, NeuroAffective Touch™, Interpersonal Neurobiology (IPNB) and the NeuroAffective Relational Model™ (NARM). Over the next year we plan to expand our faculty and develop new courses and programs for both the general public and mental health professionals.